I have admired pacers always. I remember being at one of my very early marathons, maybe even the first one, Chicago, and seeing the group of people with the signs and thinking, "Ooooooooo, the pace team, this must be a real race." In later marathons I ran with pace groups sometimes, although I never stayed with them till the finish. I always either dropped back or else felt strong and went on ahead. (Okay, that second one only happened one time, but it did happen!) I remained wowed by pacers. They were like... maybe not running gods, exactly, but definitely the coolest runners there were. I mean, elite athletes are cool and everything, but they are always hidden in their own private tents pre-race and long-gone by the time I finish, not mingling with us normal people, and they are laser-focused on winning and training and not on socializing and having fun, which makes them less interesting to me as runners. Pacers, on the other hand, not only talk to regular runners, but enjoy it. Pacers welcome conversation and can always talk during a marathon even during the hard miles. They never look like they're having a hard time. They look like machines no matter where they are on the course. They don't need ear buds to run. They have the confidence to be like, "Yeah, I can totally predict how fast I'll run this race down to a few seconds, no big deal." And they can do it all while carrying a sign! So, yes, always thought pacers were cool. Then came the Detroit Marathon a few weeks ago. I knew that my running friend John from Arizona has been a pacer for a while, but I hadn't seen him since I left Tucson. Well, he came to Detroit to be the 3:45 pacer (after being the 3:30 pacer in Chicago a week before, no big deal). I wasn't running, so I went out to be a spectator and cheer on the 3:45 group. He was right on with his time and somewhere that day I started thinking, I think I might be able to do this. I mean, I've run a lot of marathons and if I picked a time that was slower than any of my normal marathons, so I knew I could do it without too much difficulty, that should work, right? I contacted the guy who runs John's pacing team, Marathon Pacing, and he said to send him an application. So I did, and didn't hear anything back, until last Tuesday when I got an email saying a pacer cancelled and could I pace Harrisburg on Sunday? I said sure, as long as it was a pace I knew I could do. He gave me the 4:30 group, which sounded perfect for my first time, and gave me some assignments involving track repeats and a stopwatch. I did the assignments. They went okay, so I headed out to Harrisburg on Saturday. Harrisburg is an 8-hour drive from here. I don't think I have ever been there. First surprise -- it is a really cool city! It's on the banks of the Susquehanna River, which is a really, really beautiful river, and there are like six or seven bridges right in a row. Two of them go to this island called City Island, where there is a stadium and some other tourist attractions. The state capitol building is really grand, much more than I would have thought. The downtown is super walkable and looked like a really fun place to explore, if only I had had more time there. I barely had any time at all. We got there around 3:00 (we -- I forgot to mention that I picked up another pacer in Youngstown to carpool, someone I had never met before but I just assumed he would be cool because he was a pacer, and he was cool, so I was right), and went straight to the teeny tiny expo. The expo basically consisted of bib pick-up, one gear booth, and the pace team's table. There were like six of us at the table and never more than two other runners in the expo building at once. There were 700-something runners in the marathon but it was one of the smallest expos I've ever seen. After the expo closed, we went back to the hotel. Another cool perk of being a pacer -- I don't have to pay for my own hotel! And it was the Hilton, vastly nicer than the Red Roof Inns and Motel 6's I usually stay at. I had another pacer as a roommate, and she was cool too. After we unpacked, we went out for the pacer dinner at a little Italian restaurant close to the hotel where I met all the other pacers. ALL of them were cool. There were some seriously accomplished runners in that group but you would never know it unless someone else in the group pointed out the accomplishments. No one bragged about themselves. I really believe this is because running is amazing for keeping you humble! (That's not the only thing it has in common with being a guide dog instructor.) No matter how good you are, there's always someone faster than you, and no matter how many things you win, there will always be a day where your body just won't let you do what you want to do even when you've done everything right. Hence, humility, and humility is a very valuable quality in a person. After dinner we had a meeting back at the hotel, where they covered subjects like logistics of race morning, what to do if someone needs medical assistance and what to do if you're having a bad day and won't be able to finish on time. The other pacers gave me all kinds of information and advice. It was great to feel like part of a group of people who were laser-focused on DOING IT RIGHT. We were supposed to aim for 30 seconds under our predicted finish time, so for me, 4:29:30. Plus or minus ten seconds on either side of that was acceptable, but more than that was not desirable. This may not be a paid job (other than the waived entry fee, the hotel, and the dinner), but I took it just as seriously as if it was, and everyone else did too. I went to bed feeling prepared. Race morning was sunny and 43 degrees, a great improvement over the forecast of 32 degrees. There was no McDonald's within walking distance so I made do with Dunkin Donuts instead. (I prefer McD's, but I'm flexible.) All of us walked over to the start line together. I was really excited and only a tiny bit nervous. The tiny bit nervous was just because of the unknown. Sure, it's always possible to have a bad day but I felt fine, no pain anywhere, I knew the course was flat, and we had perfect weather. so the odds were totally in my favor. People started talking to me as soon as I lined up in my spot at the start line. There were a few first timers, several who had done anywhere from one to ten previous marathons, and one guy who was on #87. I was not nervous at all talking to these people; I was filled with confidence that I would be able to get the time I wanted, all I had to do was watch my watch. I had been told that when pacers miss their time it's usually because they have gotten distracted talking to their group and not been paying attention to their watch. I vowed that that was not going to happen to me. I had a stopwatch on my left wrist for mile splits (according to the mile markers, NOT according to my GPS miles) and my Garmin on my right wrist so I could check average pace and make sure I was in the ballpark all the time. I also had a chart with the goal mile times taped to my sign. So my plan was to check my Garmin every few seconds to check average pace (which should be 10:18 per mile), and when my Garmin beeped the mile, start looking for the mile marker (which would NOT be the same as the Garmin mile, because 99% of the time the GPS measures the course as long, or more than 26.2, like 26.4), and then try to adjust my pace to the mile marker so that my time when I got to the mile marker was as close as possible to the goal mile time taped to the sign. This course was a nice one for pacing because there were several out-and-backs where we got to see the other pace groups. Usually I don't know anyone in the marathons that I run, so it was nice to see familiar faces at predictable intervals. I had a great group for almost 18 miles. Everyone seemed to have picked the right group because they were breathing easy and able to keep conversation going. One of the things I had wondered about was how much are you supposed to talk to the people you're running with? The answer is, as much or as little as they want to talk. I was running a pace that was easy for me so I had plenty of breath for talking. There were several locals in the group and they enjoyed telling me about local history and, for some reason, stories about the river. They all liked to talk about the Susquehanna River and when it flooded and how you can see the high water marks and how when it's low, like it was on marathon day, you could practically wade across it. (I did in fact see a fisherman halfway across the river standing out there in hip waders.) Maybe we talked about the river so much because almost all of the course was alongside it. For once I never got tired of looking at the same scenery. Usually in a marathon I like a change of scenery no matter how beautiful the scenery is. Marathons like Tucson (Catalinas on your left, open desert on your right) and Lehigh (running through shady trees alongside a canal) have spectacular scenery but get boring after about 10 miles, but this one never did. Just take my word for it, the Susquehanna is a really pretty river. Or don't take my word for it; go run this marathon and see for yourself! The leader passed us right around the half. That's always something to look forward to on courses with a lot of out and back. Not too long after him was the 3:15 pace group, and then all the rest like clockwork. The turnaround was between 17 and 18, and there, sadly, was where my group fragmented and most people dropped off the back. (Been there, done that. 17-18 is usually where I have fallen off the back of my pace group, when I've used them.) Even though the "back" part was mostly flat or slightly downhill, and we had a tailwind, we were running straight into the sun, and there was a lot of sun. Air temp was around 50 but the direct sun made it feel a lot hotter. I discovered one cool thing about the pace sign -- it can be used as a sun visor. Seriously, I held it right in front of the sun and took care of that problem. My group was gone by this point except for the guy who was running marathon #87. He still looked strong and I really thought he was going to finish with me. But his back started to bother him around Mile 22, and he had to drop back by Mile 24, so I was running by myself until I picked up a couple more people in the last mile. They wanted to finish with me but I had to slow down because I had something like 50 seconds to burn up in order to come in at 4:29:30. 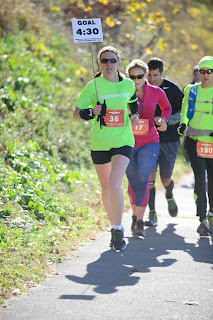 We passed the Mile 26 marker and I slowed to the slowest jog possible because I knew that the turn at the end of the block would put me in the finishers' chute and you really can't walk there. That second-to-last block was soooooooo slow. I seriously felt like time had slowed to a crawl. People were yelling, "Go! Go!" at me but I totally ignored them and kept my eyes glued to my watch and tried to guess how long it would take me to run that last block. It was really a bizarre last .2 miles. It felt totally wrong to hold back in the last blocks, especially when physically I felt better than fine from running at a pace so much slower than my normal one, but at the same time I really, really wanted to nail my time. I never took my eyes off my watch as I ran up to and over the finish line -- 4:29:32. Pretty good! Even better, I felt fine, which is a good thing at a marathon that has finish line food like this one. Soup, mac-n-cheese, giant pretzels, I forget what all else now but it was good food, a total "buffet" finish line spread that I see more and more often now and therefore expect all the time. I ate a little then went back to the hotel for a quick shower before the long, long drive back.